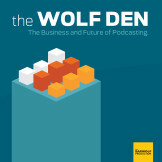 Alison Hockenberry, chief of staff of Dubner Productions and executive producer of “Freakonomics Radio” and “Tell Me Something I Don’t Know,” joins Chris Bannon on The Wolf Den. The two discuss how Alison’s background as a TV news producer eventually led her to running the “Dubner empire” by embracing the power of saying yes to things. Alison also explains the genesis of “Tell Me Something I Don’t Know” and details the early trial and error period that led to the show it is today.